Designing outdoor living spaces over the past 13 years in and around Waterloo Region, I’ve come to realize that few landscape elements can add as much impact to your yard as a water feature. From small bubbling rocks to large scale ponds or natural swimming pools, it’s hard to compete with the the sights, sounds and ambiance created by moving water. And it makes sense, really. Humans have always been drawn to water. Our cities and towns grew alongside oceans and rivers, as children we couldn’t resist the temptation of creeks and puddles, and who doesn’t love heading off to the beach or lake on a hot summer week-end? So if you’re in the midst of planning an outdoor living space, think for a minute how nice it would be to have your own pond-side patio. 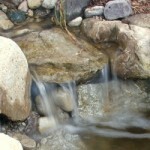 Here’s a great video on living the water feature lifestyle, put together by the folks at Aquascapes. Please contact us for more information on designing water features and natural swimming pools throughout the Kitchener, Waterloo, Guelph, St. George, Brant County, Stratford, St. Mary’s and Woodstock areas of southern Ontario.